Also known as Poro and Palo Santo, the Machete plant is a member of the pea family, Fabaceae. This shrub or small tree grows 3-7 meters tall, and has a short, spined trunk with multiple branches. The leaves have three heart-shaped leaflets approximately 25 cm long each. 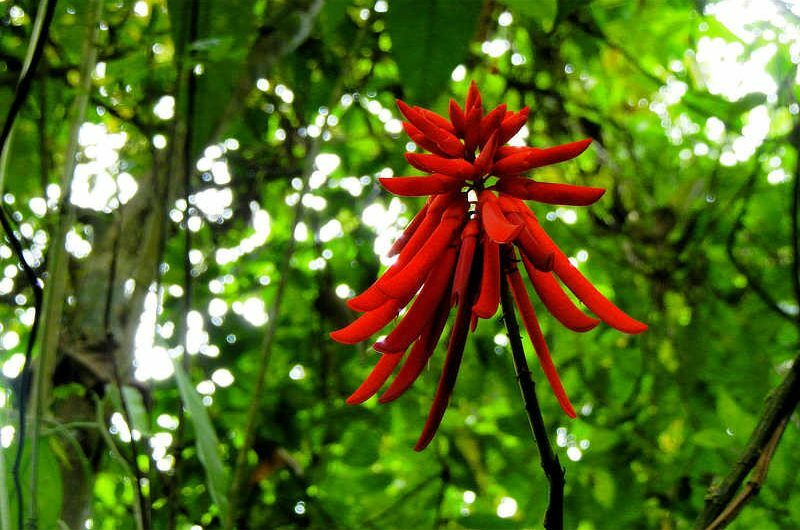 The bright red flowers give this plant its name—the flower standards are long, narrow tubes up to 9 cm long, and are shaped like the blade of a machete. The standards are arranged in an inflorescence at the end of branches. Characteristic of the family, they produce a legume (fruit) containing several bright red seeds. Each pod is 15-25 cm long, which twists and opens at maturity to expose the seeds. This tree flowers from September to October, and fruits mature in November and December, usually shedding all the seeds by March. This plant is used by many animals—the leaves are a food source for some butterflies and moths, and many birds visit the nectar-rich flowers, including larger understory hummingbirds such as the Long-billed Hermit. In Panama, it is common and widespread in the forests across the country, and can be found in the vicinity of the Canopy Tower and Canopy Lodge.